While trying to tackle the hugely messy task of organizing pictures on my computer, I came across a few shots of the crayon letter frame that I made a friend of mine for her baby shower. 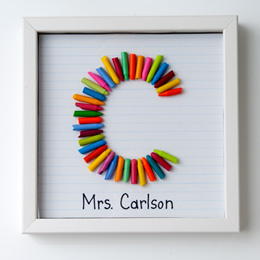 It’s always hard to personalize a baby or wedding shower gift since the couple normally creates a registry of things that they need, so I was excited when I saw a few ideas on Pinterest that used the crayon monogram as a gift for a teacher. 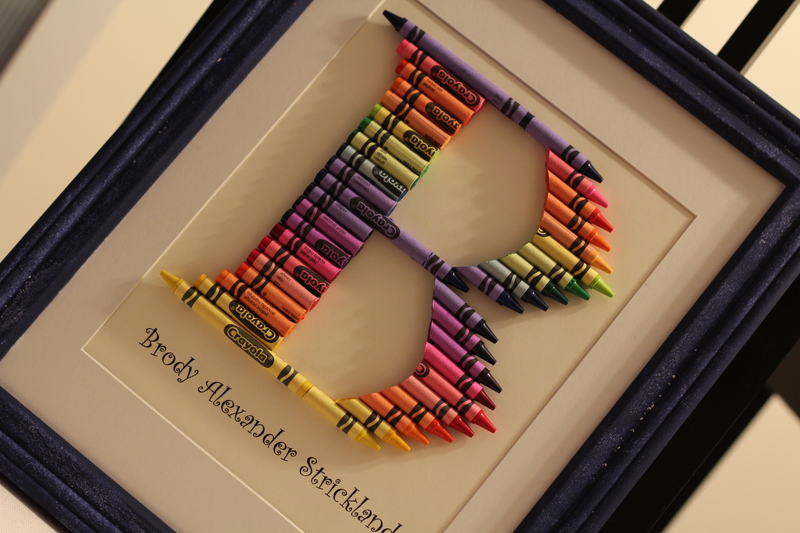 I thought the crayon monogram frame would be perfect for a baby shower gift, and would make a nice personalized addition to the registery items that I’d already bought. Clothes, blankets, bottles, and toys normally make up the bulk of what you see on the gift table, so I thought having something that they could use to decorate their sweet little baby’s nursery would be quite useful. 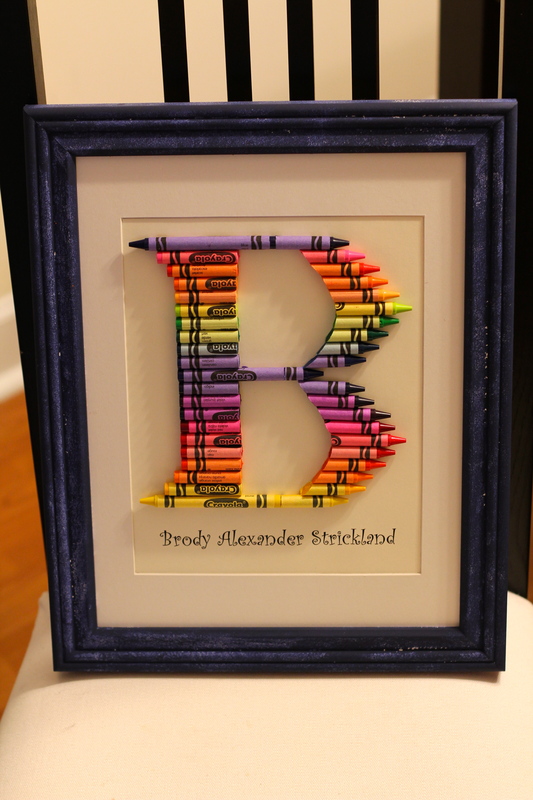 It would have been nice if little Brody would have been named Logan or Isaac, because the curves of the “B” really made cutting the crayons a challenge. I opted to cut the crayons on a slant so that the curves of the B would be crisp (sort of like the first inspiration picture from Disney), but it would certainly be easier to cut them straight across (like the second inspiration picture from The 3Rs Blog) and just space them out to mirror the curves of the letter. 1. Print (or draw) your letter on a piece of thick paper. Make sure the font size you choose fits with the frame you’re using and keep in mind that the size will be different if you’re using a matte in the frame. 2. 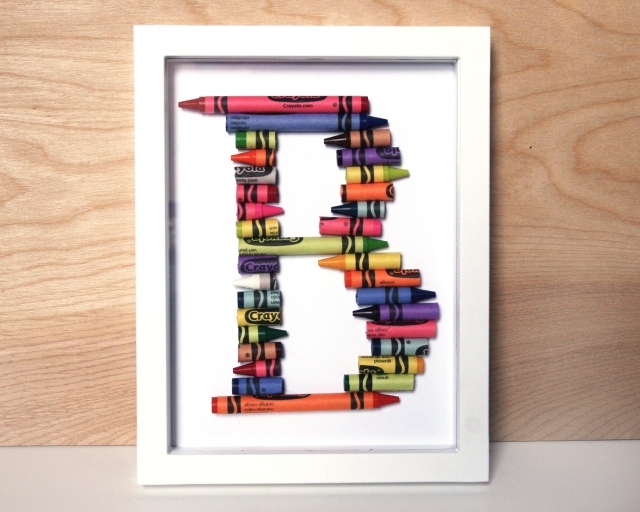 Arrange crayons over the letter so that you have an idea of how the crayons will line up and how long or short you’ll need to cut your crayons to be proportionate to the frame. 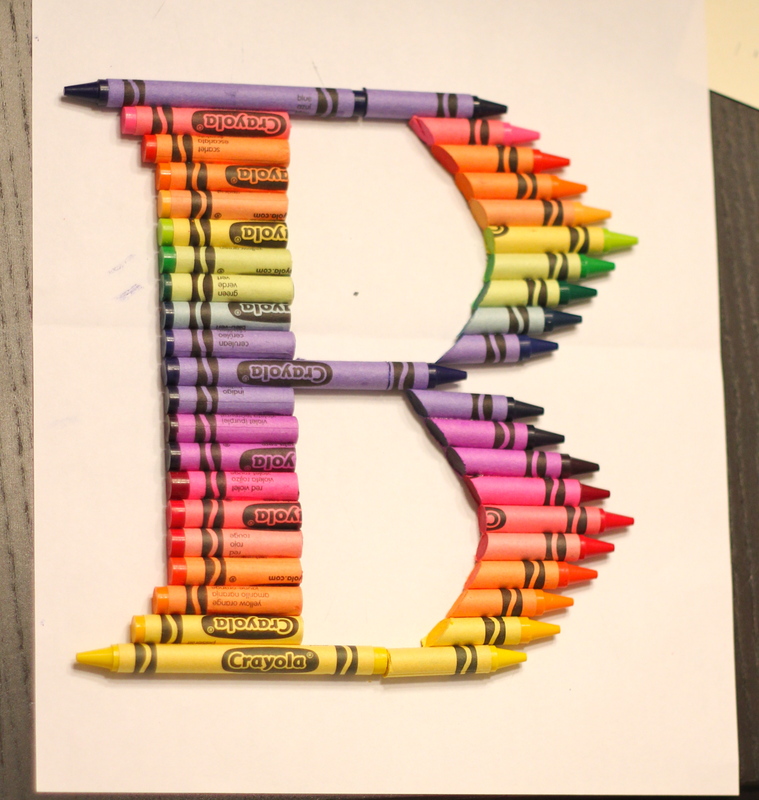 If you’re creating a letter with curves (like B) and want a clean crisp look to the inside of the letter, use a pencil to trace the curves onto the crayons – this will represent where you’ll cut the crayons on a slant. 3. Start with the straight line of your letter. 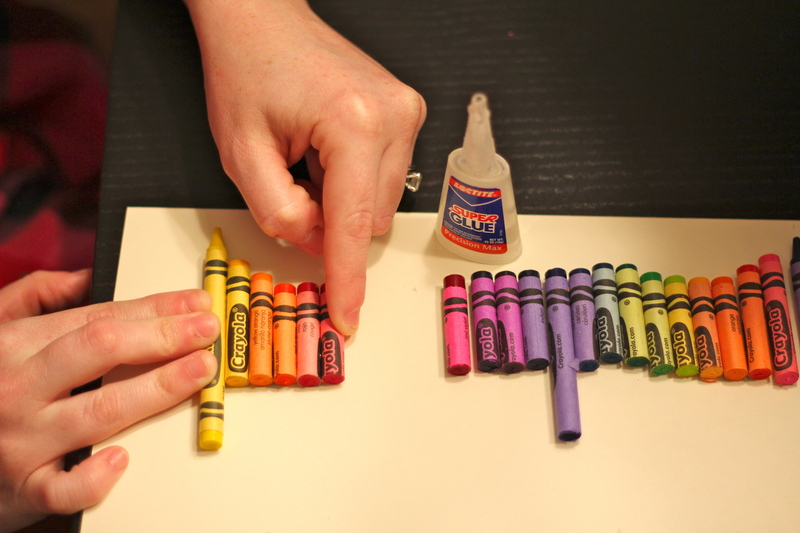 Cut by scoring each of the crayons, one by one, all the way around with your knife (don’t just try to cut straight down) and then snap in two. This will give you a clean edge. Only use this technique with crayons that you are cutting straight across (not on a slant). 4. 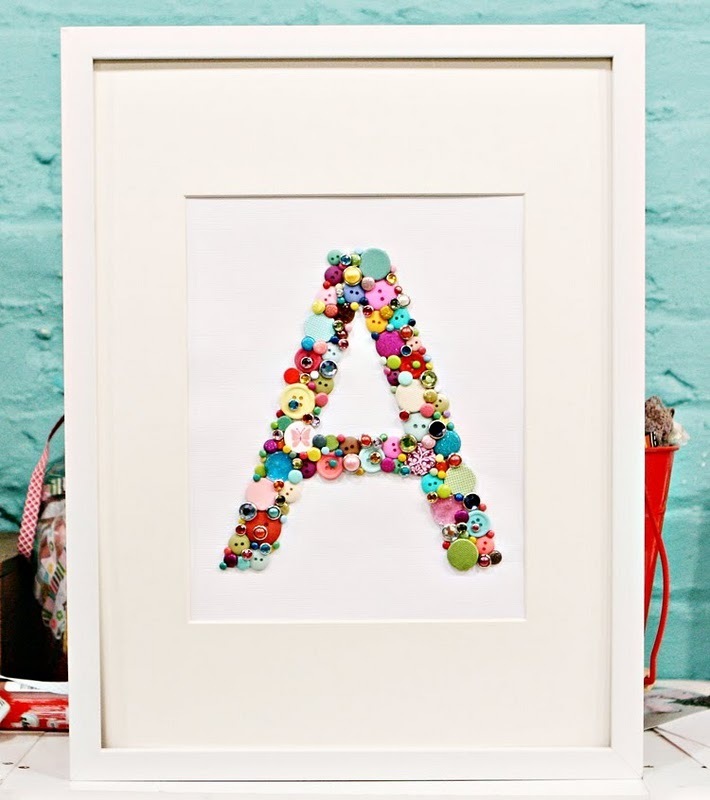 As you cut, line your crayons up to mirror the printed letter, don’t glue yet! 5. For the curvy parts of the letter, use your pencil marks as a reference on where to cut (this is really tricky – just double and triple check to make sure things line up before cutting). Using the blow dryer, heat the knife for 20-30 seconds. Once the knife is hot, cut the crayon in line with the pencil markings, sawing back and forth for a clean and crisp cut. Line up the crayons as you go to make sure you’re getting a clean and even curve. 6. Once all of your crayons are cut (for our project, that meant about 3 days later! ), start gluing the crayons together from the bottom of the letter and work your way up. I glued mine in three sections – the straight line of the B, the top curve, and the bottom curve. 7. Once your crayons are all glued together (or glued into a couple of sections), coat the back with super glue and transfer to the paper. Let dry for a few hours before standing the frame up to admire your work! Creating the crayon letter was definitely a lot more work than I thought it would be, but it’s such a fun project and sentimental gift idea. I did leave a bit of room at the bottom for Brody’s name, and I actually printed it out on the computer since I can’t write in a straight line to save my life. 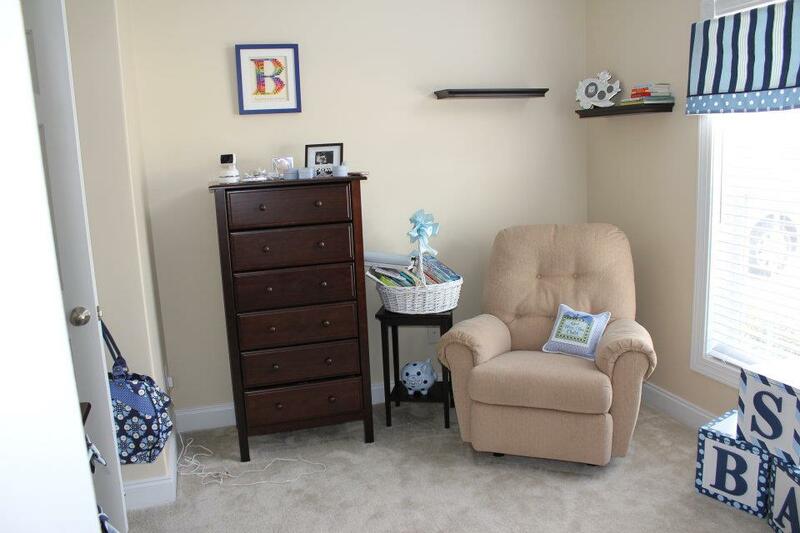 Brody’s room was also painted a neutral color with different shades of blue accents, so I painted the frame a dark blue to give it a little extra color and make it pop when hung on the neutral wall. I really want to make my nephew one for his room, and I even have all the supplies ready to go, it’s just that his name is Jake and those darn curves still haunt my dreams! This would also be cute to make with buttons, like this one from Spearmint Baby , and would make a great DIY wedding gift. I’d really like to make one for Steve and I to hang up (of course our last name would have to start with a “B”) and use buttons in a chevron or ombre pattern. It’s been a while since the shower, and little Brody has now been welcomed into the world. I’m sure he is enjoying his crayon letter as he naps in his cozy crib. 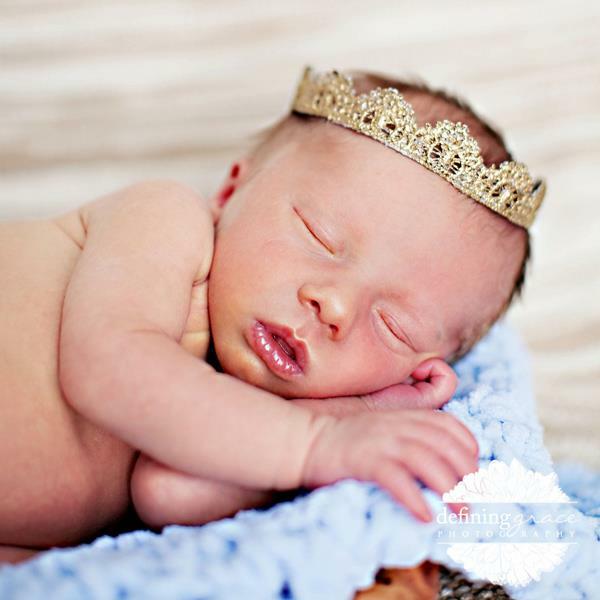 I’ll leave you with a picture taken by Defining Grace Photography that is sure to be “awwww” inducing, and I’m pretty sure he’s dreaming about all the work his Aunt Stacy (and Uncle Steve) put into his awesome nursery art.